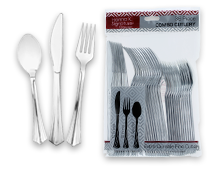 Disposable Silverware, Plastic Spoons and Forks, & Party Cutlery. Now that the guests have arrived and you’ve set the buffet table with all sorts of yummy treats, appetizers, feel-good snacks, and party foods, do you seriously expect your partygoers to eat with their hands? How uncivilized. You have two options here from which to choose: break out your own silverware and spend the after-party hours of washing everyone’s used forks, knives, and spoons or equip your food tables with a plentiful amount of plastic spoons and forks. Depending on the number of guests, the latter would appear to be the most efficient course of action. For large cooking parties, outdoor barbecues, picnics, beach parties, on-the-go grilling or in any situation where you’d rather not use your own expensive silverware sets, browse our assortment of plastic party cutlery, heavy duty plastic utensils, plastic silverware sets, and disposable silverware available in clear or colored, from sets of 4 to bulk packages of 96. They’re an absolute requirement for any mass gathering of hungry people; wedding parties, large birthday parties, kids parties, cookouts, etc. Sure, nobody enjoys cleaning up after the festivities, but plastic disposable cutlery saves time and extra work. Pitch the discarded forks, knives, spoons, and serving utensils in the plastic recycling bin once everyone’s done eating. You’ll save water and help the promote recycling, which is good for the environment. Shop 1SuperParty for the best deals on party cutlery, plastic spoons and forks, plastic utensils, heavy duty plastic utensils, polished silver-look disposable silverware, and party tableware.